....nicotine addiction is the leading cause of death throughout the world. Cigarettes work by manipulating endorphins so consequently an effective remedy must also target these chemical signals. To put it simply, an endorphin is a “feel good” chemical that is released throughout the body, thus creating an overall sense of well-being. When a person smokes, the endorphins are stimulated artificially. This inhibits the natural course of endorphins and may lead to inappropriate release of the chemical. Eventually a smoker cannot release endorphins without the help of cigarettes and therein lies the basis for addiction. The laser therapy that we use will create a constant flow of endorphins throughout your system. Our treatment procedure will keep these endorphins flowing for nearly two months, during which time previous smokers will no longer feel the cravings that have left them dependent on nicotine. This will allow you the opportunity to rid yourself of the deadly toxins associated with tobacco usage so you can create a healthier lifestyle. By the time these pleasurable chemicals are done flowing, you will be clear of any hurdles of addiction or dependence that would have previously inhibited you from quitting tobacco products. The Center for Laser Therapy has helped thousands of people and is highly successful. We are confident that, with your commitment, we can help you quit smoking for good. Nicotine addiction consists of both a physical and mental addiction. Our laser therapy addresses the physical aspects often associated with quitting. It is important to remember that every person is different and has individual psychological and emotional aspects to deal with when quitting. Hence,the process cannot be guaranteed. However, the Center for Laser Therapy will work diligently with every client to help support their success. Despite our success rate, involvement in any kind of smoking cessation program is contingent on the fundamental understanding of the difference between a physical craving and a habit. While our laser therapy will undoubtedly curb your physical dependence on nicotine, some people may have greater difficulty than others in overcoming the routines and behavior they have long associated with smoking. To that end, we make an agreement with everyone who seeks treatment at the Center for Laser Therapy that if they ever find themselves in need of a follow-up session we will book them for a booster treatment at no additional cost for a period of one month from the original treatment date. Your success is measured immediately. Unlike drug therapy, there is no need to continue smoking to help your body adjust to unfortunate side effects. With your treatment from the Center for Laser Therapy, there will be no feelings of being sick on a daily basis. Laser Therapy is instantaneous. Your treatment date is your quit date, there are no long term plans or delays in quitting. Every day that someone smokes, is one day closer to them dying from a nicotine related death. Our clients experience no cravings or withdrawal symptoms. The therapy you receive at the Center for Laser Therapy will not only address your nicotine addiction but will help with the issues of weight gain and stress management. The cost of Laser Therapy is only $225, far less (and safer) than prescription drugs and nicotine replacement therapies. For millions of Americans, prescription drugs are a way of life – about 2 billion are dispensed each year. We rely on them for everything from allergies to diabetes, to depression. But in a study published in The Journal of the American Medical Association, researchers found that adverse reactions to prescription drugs may rank somewhere between the fourth and sixth leading cause of death in the United States. As with many drug therapies, the original issue may be less of a problem than the reaction to treatment, and the old dictum “the cure was worse than the disease” has frequently been all too true. Of 33 million patients admitted to hospitals in 1994, more than 100,000 died from toxic reactions to medications that were administered properly, either before or after they were hospitalized. Additionally, more than 2 million suffered serious side effects. Though the FDA has been lauded for a much-needed increase in the number of new drugs it approves each year (a record 46 in 1996), critics say it hasn’t done enough to monitor medications once they’re on the market. The FDA requests reports on adverse drug reactions from hospitals and physicians, but few participate in this voluntary program. Information that might warn of – or perhaps even ward off – side effects is buried in doctors’ offices and hospital wards. Every medication is a double-edged sword and it may take years to realize their ill and sometimes deadly effects. Regarding a recent study of Chantix, the actual study only tracked success up to 12 weeks after treatment began. Non-smoking participants in the study were considered successful at the end of the 12 week trial even if they used nicotine replacement products such as the patch or gum. To be effective, Chantix must be used for an initial 12-week regimen with an additional 12-week follow-up for those who have quit. The drug manufacturer has not made public any information about the success/failure of this study after the initial 12-week period. We suggest you review the Chantix web site http:www.chantixvarenicline.com to review a complete list of contraindications and side effects, which include psychotic dreams and suicide. The total cost for a 24-week course of treatment is $694.56 as compared to Laser Therapy at $225.00. In a USA Today report, referencing a Journal of the American Medical Association on the unintended side-effects of properly prescribed, and administered medications, the authors estimate deaths from such events to exceed 106,000 per year. To offer some perspective on this number, 57,000 US soldiers died in the Vietnam War! Are you the Guinea Pig for others? We often have clients that come to us for therapy and say “I have co-workers that are waiting to see if this treatment works for me. If I quit smoking, they are all going to come in too!” You have to understand that what works for one person, may not give another person similar results. It’s the same reason that some people can quit cold turkey with ease and others have tried everything from hypnosis to nicotine replacement therapy and have failed. Everyone’s body chemistry is different and just because something wasn’t helpful to someone else, it doesn’t mean it won’t be successful for you. We also have a lot of clients that say “If it works for me, it can work for anyone. My spouse says he/she will come for therapy if I stop smoking for one month.” We highly recommend that if you and your spouse both want to quit, please visit our clinic together for treatment. The rate of success for two unified spouses is higher than an individual spouse who returns home to a “smoking household”. The support and encouragement that spouses provide for each other can make a phenomenal difference in the transition to non-smoker. How long does the treatment take? The laser therapy treatment takes about 25 minutes. However, you should allow about an hour for treatment and consultations. Your comfort level as a non-smoker is very important to us, and we will never rush you out so we can remain on schedule. How many treatments will I need? You will be a successful and comfortable nonsmoker in only one visit. What does the treatment feel like? The treatment is completely painless. Most clients feel completely relaxed and some even fall asleep during the laser treatment. Are there any health conditions for which laser therapy is not recommended? Yes. You would be excluded from receiving a laser treatment if you are pregnant, taking photosensitive medication or steroids, or have certain cancers or epilepsy. No adverse side effects have been documented. We recommend that you discuss laser therapy with your primary care physician or medical specialist if you have specific concerns related to your medical health. Are there any side effects resulting from the laser therapy? The laser is completely safe and provides no known adverse side effects. Even though I have been smoking for over 40 years; will this therapy work for me? Yes. It does not matter how long you have been smoking for or how many cigarettes you smoke a day, all you need is the desire to quit. Most of our clients have tried 4 to 6 methods of quitting without success; don’t give up, we can help. Is the treatment affordable? The cost of our treatment is $275. Because quitting smoking may create anxiety for a new non-smoker, we also offer a no-charge second re-treatment for a period of thirty days from your initial treatment date. 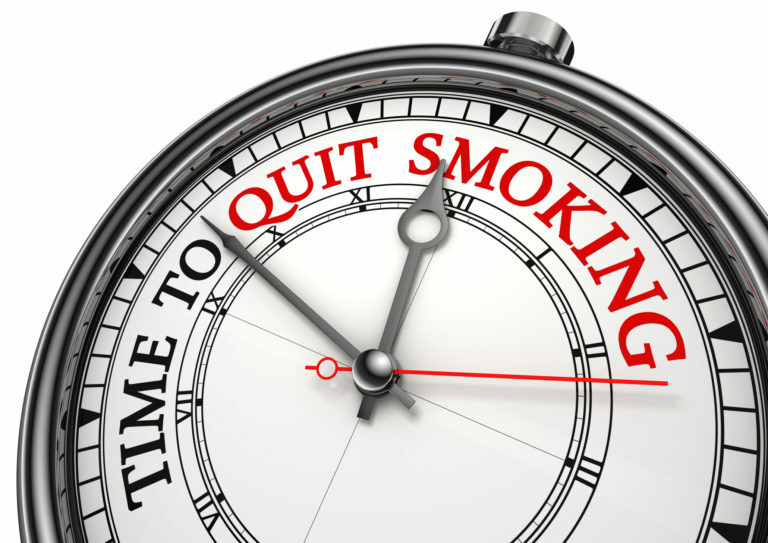 The Center for Laser Therapy is by far the safest and most economical way to quit smoking. Will I put on weight if I stop smoking? Along with your smoking cessation treatment, we will also treat you for appetite suppression. This treatment will help control food cravings while stimulating your metabolism. The Center for Laser Therapy also offers a comprehensive weight management program individually tailored to meet each client’s weight loss goals. Inquire for more information. Is the treatment guaranteed? The Center for Laser Therapy has helped thousands of people and is highly successful. We are confident that we can help you quit smoking with your commitment. Nicotine addiction consists of both a physical and mental addiction. Our therapy addresses the physical aspects of nicotine addition. Still, every person is different and has individual psychological and emotional aspects to deal with when becoming a non-smoker, hence, to that end, the process cannot be guaranteed. However, we will work extensively with each person to support their success. Appetite Suppression for smoking? We treat the energy points associated with appetite control to stimulate your metabolism. If you’re concerned, we can discuss further with you during your consult to ensure all your needs are met. We also offer a comprehensive weight management program individually tailored to meet each client’s weight loss goals and to accelerate results. Inquire for more information.